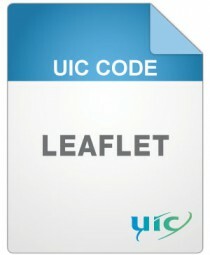 This leaflet sets out the coding system for dates and periods that must be used by all UIC members in electronic data interchange. A system based on ISO Standard 8601 that must be used for all new message development. It offers railway companies the possibility to exchange date and period data with non-UIC parties. A proprietary UIC system. This system is kept in the leaflet only to enable railway companies to continue to use existing messages and, as such, to avoid main changes in their systems. In the long term, it will be abolished. In addition, the leaflet lists some UIC proprietary provisions which have no equivalent in ISO Standard 8601. They may be used together with the ISO Standard 8601 coding system.